If you're craving barbecue that is both honest and upscale, go to Jack Stack's. : If you're craving barbecue that is both honest and upscale, go to Jack Stack's. 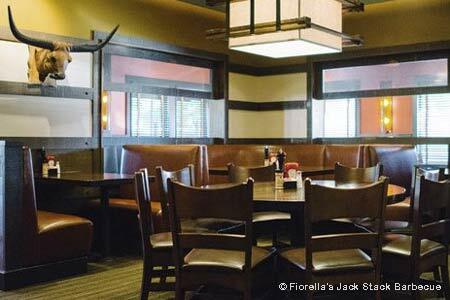 The Fiorella's are the area's royal family of barbecue and it shows in the quality of the food. The fresh-cut, hand-breaded onion rings, stacked on a handsome copper skewer, are thick, sweet and greaseless. Be sure to try the fire-kissed jumbo shrimp with homemade rémoulade, too. Jack Stack's has all the barbecue basics: the burnt ends, ribs, sausages and sliced meats. It also serves some specialty items, including the Crown prime short ribs of beef. You'll get three pounds of some of the best meat in town; in fact, no one else in town serves these. Try the beans---thick, tangy-sweet and loaded with bits of meat. The grilled fish is always fresh and just a little bit smoky from being cooked alongside the meats. Desserts are not a forte here, but to satisfy the sweet tooth, go for the bread pudding with either vanilla or rum sauce.